A spokeswoman said it was not satisfied with the company's involvement in settlement activity in the West Bank - which contravenes international law. Israel's ambassador to London said the decision was "appeasement to those who slander Israel". The UK has recently moved to toughen its policy towards Israeli settlements. 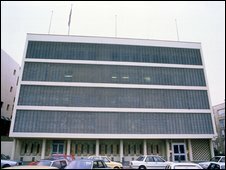 The Foreign Office said that moving the British embassy's location in Tel Aviv had been considered for years, with a plan to take over three floors in a skyscraper in Tel Aviv. But last year pro-Palestinian groups began campaigning against the move, saying that the new building was part-owned by Africa-Israel Investments Ltd, a company which had built in the occupied Palestinian territories, in contravention of international law. Officials in the Foreign Office have confirmed that their concerns about "settlement activity" led them to withdraw from lease negotiations with Africa-Israel. Embassy spokeswoman Karen Kaufman told Associated Press news agency: "No leases were signed, and part of the reason was we looked into the issue of Africa-Israel and settlements and settlement holdings and we asked for clarification on those issues." She said the company's response was unsatisfactory. "The UK government has always regarded settlements as illegal, but what has happened in recent months is that we are looking for ways to make a difference on this issue," she added. Israeli ambassador Ron Prosor told Haaretz website: "Such a policy doesn't contribute anything to advancing a peace agreement in the Middle East." He added: "Diplomats in the British embassy in Tel Aviv are not expected to stop eating Israeli bread because it's also marketed in the West Bank." Africa-Israel said in a statement carried by AP that Britain had a "fundamentally wrong" view of its activities in the West Bank. It blamed pro-Palestinian organisations in Britain for promoting a "biased, one-sided political agenda" against Israel. "It is lamentable that this pressure ends up being vented against Israeli business entities that have no impact whatsoever on the setting of Israel's policy," the statement said. All Jewish settlements in the Palestinian territory are regarded as illegal under international law, although Israel disputes this. More than 400,000 Jewish settlers live in the West Bank and East Jerusalem, areas which were captured by Israeli in the 1967 war.